Supernova remnant Puppis A is illuminated with red and green infrared light and blue X-ray light. Areas where the infrared and X-ray light overlap are shown in pastel. 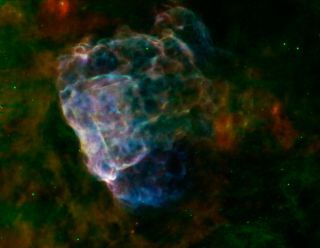 A violent star explosion long ago has left behind an eye-catching supernova remnant, an ethereal grave marker in space that has been seen like never before by scientists using three space telescopes. When supersized stars reach the end of their lives, they explode in a brilliant burst of light that can outshine entire galaxies and give off more energy than a smaller star can produce in its entire lifetime. The giant destructive supernova explosions leave behind beautiful wisps of dust and gas called supernova remnants. NASA captured an image of one of these star ghosts by combining infrared light from NASA's Spitzer Space Telescope, as well as X-ray light from space agency's Chandra X-Ray Observatory and the European XMM-Newton telescope. Heated dust particles give off most of the infrared light shown as red and green in the new image. Other material warmed by the shock wave emit X-ray light and are shown in blue. Areas where the infrared and X-ray light blend together are colored in pastels. Astronomers determined the dust in the area around Puppis A is about a quarter of the mass of the sun, according to a NASA statement. Data from Spitzer shows the shock wave lights up as it zips through the huge cluster of dust, breaking apart the dust particles as it goes. It takes a star several times the size of the sun to end its life with a supernova. The explosions can generate the heavy elements that help form new stars and planets. Scientists hope studying how supernova remnants tear through space and interact with other materials will reveal more about how the Earth and solar system formed.